Hard Drive was created for the Valor vs Venom line and serves as a Battlefield Computer Specialist. I guess he proved to be less than popular since he never made a second appearance. Most of his parts were used to create Med-Alert for the DTC line. For my version, I started from there. Since I made Med-Alert for last year�s Project New Sculpt, I went back and used a very similar recipe for the body. At first, I was going to buy an original Hard Drive for the head. However, by playing around with some fodder, I managed to build aversion that I�m happy with. This is not a straight up match for his Valor vs Venom figure. I decided to mute the colors a bit to match the parts. I initially tried to go with a Spytroops version, but didn't like the build. I then dug up an old Valor vs Venom figure, but could not quite figure out what was going on with the strapping... I'm not sure what to make of it. I compromised by tying in that strapping look to the suspenders and tried to color it to make it flow a little bit better. I purposely built him smaller than the rest. Kamakura is probably one of the best know new characters to come out of the new sculpt years and has become a recurring figure in Hasbro�s lineup in the last few years. He got several new sculpt figures, all of which suffered from proportion issues or action features. He has had two modern era versions, but none of them have been true to his new sculpt look. Basically, I tried to take the best from both eras and combine them. The Built to Rule(BTR) line gets a bad rap� and it is entirely deserved in my opinion. That said, the line did introduce a few new characters. Although they did not catch on and have remained very obscure, I thought that they would be fun to explore. Hollowpoint is GI Joe�s first Range Officer. The BTR figure had an interesting look that was very similar to Rock & Roll v2. I originally planned to use Retaliation Clutch�s head for this custom, but I was lucky enough to find a loose Hollowpoint for 2$ at a comic book shop. Shadow Viper�s specialty is listed as counter-intelligence and he was included with the Night Prowler, a cross between a dune buggy and a soapbox racer. For my custom, I decided to try to replicate the look of the original figure as best I could. However, he will be a part of a team of Cobra couriers that carry and deliver important documents for Cobra or Extensive Enterprises. My first attempt for an HD figure was the wave 1 desert version. I wanted him to be a big guy but couldn't find a build I liked. I then switched over to trying to build his Valor vs Venom build, and didn't have much luck there. One thing with the Valor vs Venom figures is that I can't tell what exactly is going on with a lot of the uniforms. They don't make sense and end up being a little frustrating when trying to translate them over to Modern Era. I started to look at BTR figures and saw a rather different looking HD in that line that I had never seen before. I went with that one. I used the Lowlight forearms to try to translate the BTR forearm look. Switch Gears for me was an easy way to use up one of the Hawk figures from the 50th wave. Very easy custom to make and, for the most part, stays very true to the original. CLAWS Commander was one of the first figures I thought of for this project. He was actually on the list to be made for last year�s first Project New Sculpt. At the time, I could not find the parts, time and energy to get him done. The first build of this guy was going in a different direction. I was looking at the RoC Destro torso and legs as a base. It did not work for me, so �I kept pushing the custom off and moving forward with other figures. When I was nearing the end of my list, I found my stash of spare Indiana Jones figures. He came together quickly after that. I am on record as a pretty big Grunt fan. He was one of my first Joes and still represents GI Joe in my mind after 30+ years. As such, I try to fit him into many of my projects. Grunt had several figures during the new sculpt years. This custom uses the Night Force repaint of the Spytroops mold as inspiration. The original figure suffered from some proportion issues, but had an interesting paint scheme and accessories. Also, now I can add my favorite character to my Night Force shelf. Since I was making Grunt in his Night Force colors, I figured it would be fun to make his pack-mate at the same time. Gung Ho has been due for an update for a while and this was a good opportunity to use a bigger buck and give GH some bulk. I�m pretty happy with the way it turned out, except I�m not totally sold on the head (from Retaliation Roadblock). If a better one becomes available, I�ll upgrade it in the future. The Tiger Force Alpine and Crosshair 2-pack was one of the first that I bought as an adult collector. Despite some flaws, mostly with Alpine (the orange skin tone, just to name one), I liked the original figures. When I tackled these customs, I wanted to change up the color schemes a bit and go full-on Tiger Force. I swapped the tans for yellow and adjusted the rest of the colors accordingly. I like Alpine a lot. He turned out to be a combination of v2 and v4 (quite by accident). I�m not totally sold on his colors yet, but he is growing on me. If I find all the parts again, I may consider making a second version of him closer to his Valor vs Venom look. I was not a part of the original New Sculpt Project and when the gears were turning for Part 2, I was mired in the middle of a move and all my customizing gear was packed away for a few months. I did want to contribute something and Bucky gave me a starting point by saying they wanted a v11 Destro using the Retaliation wave 3.5 Firefly torso. I managed to find some time to put this together. The lower forearms are modified and despite grafting on a different typed of hand joint, still rotate. The boots are from Kwinn and were grafted on to give him a bigger stature. Then as a final touch I used a Tomax/Xamot sash to give him the pop of color like the original. Cobra Commander was one of the first New Sculpt figures that I bought when I started collecting as an adult. When I first got it, I remember thinking that the head was too small. Fortunately, as proportions go, the original figure was not bad compared to others of the era. I had hoped to make this custom last year for Project New Sculpt I and has been on my to-do wish list for a while now. However, I could not find the right parts combo that I wanted to pull it off. Once I struck on the idea of using Marvel parts, this custom just appeared. It almost built itself. Originally released in 2005 as part of the tail end of the Valor vs Venom 6-packs, the Imperial Guards are a strange mish-mash of parts. I never acquired the original o-ring figures as they did not fit into my Joe-verse at the time. However, since then, the idea of a squad of hand-picked Crimson Guardsmen that wear frightening masks and body armor and act as Cobra Commander�s personal bodyguard is one that I have come to like. Last year, Bucky and I remade the BJ�s 8-pack as part of (the first) Project New Sculpt. We thought it would be fun to tackle another 8-pack this time around. Released in 1997, Stars & Stripes Forever marked the return of classic ARAH chracaters for the first time in 3 years, fan favorites like Breaker, Snake Eyes and Scarlett were back with all-new looks. The set went through several last minute changes and didn�t come out as originally planned. Several molds were unavailable to use so characters like Breaker and Rock and Rock & Roll got radical redesigns. Still, it included 8 of the original 13 Joes. -	For Stalker, I felt that the 25th Ultimate Battle pack version was already pretty close. -	Flash replaced Scarlett to finish off the set. When we were wrapping up this project, we realized that we were a bit light on Cobras. 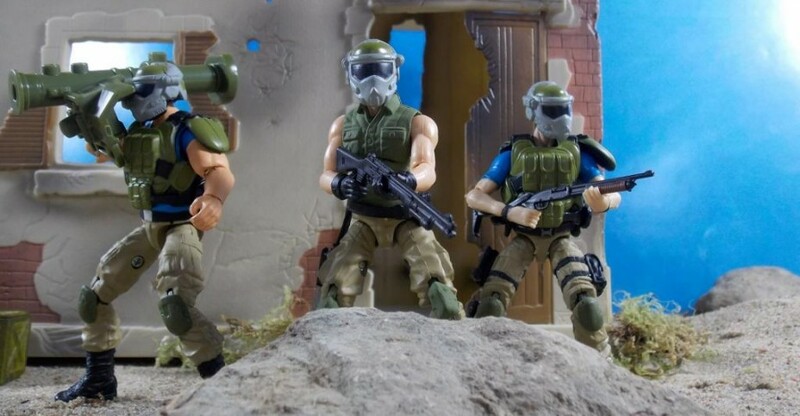 I started looking through Yojoe for ideas on which Cobras we could add and stumbled onto the Cobra Strike Team Urban Division 6-pack. The original set has several figures with fun color schemes and accessories. I settled on Firefly. He came out better than I was expecting. I may go back and make the other members of the team. Released during Valor vs Venom, General Abernathy’s original figure is well rendered for the time. It is a good representation of Hawk in a dressier uniform than many of his versions. I don’t have the original figure, so I wanted to make my own to hang out at GI Joe HQ. In the future, I would like to upgrade his shoulder straps and grenades, but I’m pretty happy with the way he came out. I am on record as a pretty big Grunt fan. He was one of my first Joes and still represents GI Joe in my mind after 30+ years. As such, I try to fit him into many of my projects. Grunt had several figures during the new sculpt years. Probably the most unexpected one was the comic book version. For my take on him, I went back to the source material – Marvel issue 4. I gave him combat boots rather than shoes and I darkened the uniform color to a reddish brown. Overall, I’m pretty happy with him even if it isn’t the most action-packed version out there. The only thing I want to improve is the belt. The Crimson Shadow Guard was one of the interesting concepts to come out of Valor vs Venom. According to the original packaging, Shadow Guards are pretty much the Night Force version of regular CGs. However, several Joe fans (myself among them) like to use them as Cobra’s secret police. I think they make much more sense in this context. This custom was probably the simplest of this project. The head is a Raginspoon cast in black and the body is DG Cobra Commander with a few added paint details. That said, I’m planning on making a few more when I get a chance. Depth Charge was the last figure I made for this project. The original was released in two different color schemes during the new sculpt era. The first, during Spytroops, was clad in blue and white. The second, on whom I ended up basing this custom, was orange and gray and released during Valor vs Venom. I went back and forth between the two options. Finally, I went with the brighter colors. I thought they had a retro look and could be displayed with my Adventure Team. This is a unique look for Ripcord to be certain and one of the first figures I lined up for the project. I really wanted to tackle him and capture that look in the Modern Era format. I went with the original head. While lacking distinct facial features like the newer heads do, I felt it was the best choice to use to not have the figure�s head look too bulky with that skinnier torso. I remember looking everywhere for this figure and finding it after driving 30 minutes to a small town Wal-Mart. There is some confusion on this figure as it was labeled a couple different ways. My initial purchase was labeled Halo Jumper, but had Ripcord's file name. After the wave finally started showing up en masse in my area, the name had been changed to Sgt. Airborne. For this project, I stuck with the Ripcord name. Chief Torpedo was released with the VAMP-Whirlwind exclusive at TRU during the Valor vs Venom days. As ARAH repaints go, the original figure was a really nice one. It was molded in a warm gray that works really well for urban operations and a nice amount of detail and paint apps. Since the original was so good, I wanted to translate the figure into the modern era but keep all the positives. I tried to stay as true as possible to the original.